INDIANAPOLIS – The 2015 NFL Draft kicks off tomorrow, April 30, and the Indianapolis Colts are inviting their fans to join one of five free viewing parties around Central Indiana to watch the draft. The viewing parties, presented by Bullseye Event Group and Bud Light, will be held at Colts Grille in Downtown Indianapolis as well as four Buffalo Wild Wings in surrounding areas. The events will begin at 7 p.m. and go until the Colts make their first round pick. The Colts have the 29th overall pick in this year’s draft. Each viewing party will include appearances by Colts Cheerleaders (7-9 p.m.), Bud Light drink specials, free Colts schedule posters and the opportunity to win autographed memorabilia. Draft coverage will be shown on the flat screen TV’s at all five locations. In addition, Colts Grille will host 1070/107.5 The Fan’s live radio show from 3-7 p.m. as well as the Colts draft radio show beginning at 7 p.m. For more information, fans can visit www.colts.com. INDIANAPOLIS – This Mother’s Day, the Indianapolis Colts mascot, Blue, is teaming up with Meijer to offer fans a unique gift for the special mom in their life. Through a personalized surprise visit from Blue that includes confetti, flowers, chocolates, and a card, individuals can give their mother a day they will remember for forever. Whether it’s an office, school, or home, let Blue surprise your mom and shower her with gifts. Blue’s Mother’s Day Visits are currently available May 5-8. Individuals who are interested in booking Blue for Mother’s Day this year can visit www.colts.com/blue and submit a request online or call 317-808-5264. On Friday night, the third annual Chuckstrong Tailgate Gala brought hundreds together to raise money for cancer research at the IU Simon Cancer Center. Friday’s event pushed the total money raised through Chuckstrong to more than $2 million since 2012. INDIANAPOLIS – This week the Indianapolis Colts and the Indiana University Melvin and Bren Simon Cancer Center launched a CHUCKSTRONG online auction to benefit cancer research. Through 9:45 p.m. Friday, April 24, fans have the opportunity to bid on 75 exclusive items, including several autographed Colts items, one-of-a-kind sports memorabilia, game day experiences and much more. To view all of the items, visit www.colts.com/chuckstrong. The proceeds from the auction will support research at the IU Simon Cancer Center. This is the first year a CHUCKSTRONG online auction has been held. 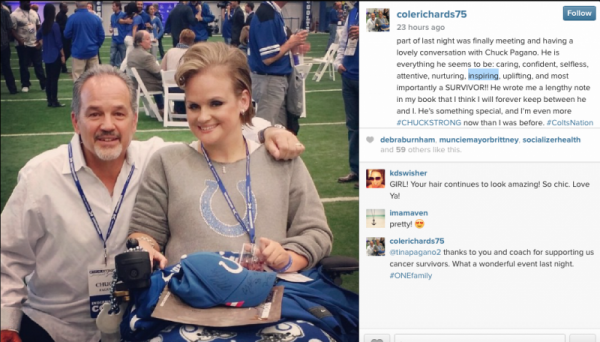 The CHUCKSTRONG campaign was launched in 2012 when Coach Pagano was diagnosed with leukemia just three games into his first season in Indianapolis. The Indianapolis community rallied around Pagano, who was treated at the IU Health Simon Cancer Center. Pagano has since made a full recovery and has championed cancer research aimed at helping others beat their cancer. Since its inception, CHUCKSTRONG has raised nearly $2 million to support the 200 cancer researchers at Indiana University looking for ways to prevent, detect and treat cancer. INDIANAPOLIS – The 2015 NFL Draft kicks off Thursday, April 30, and the Indianapolis Colts are inviting their fans to join one of five free viewing parties around Central Indiana to watch the draft. The viewing parties, presented by Bullseye Event Group and Bud Light, will be held at Colts Grille in Downtown Indianapolis as well as four Buffalo Wild Wings in surrounding areas. The events will begin at 7 p.m. and go until the Colts make their first round pick. The Colts have the 29th overall pick in this year’s draft.